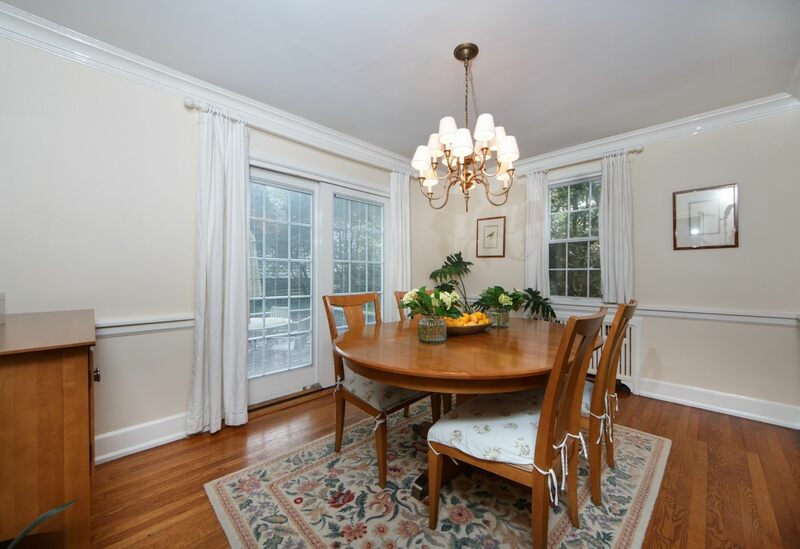 When you first arrive at 34 Meadowbrook Road, you’ll be taken away by the quaint and idyllic setting that backdrops this picturesque stone front Colonial home. 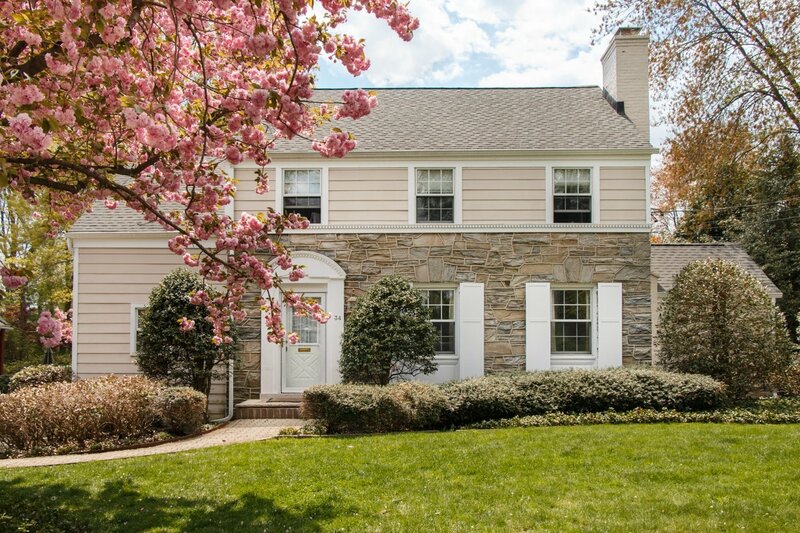 Sitting atop a virtual meadow of landscaped greenery, textured evergreens and cherry blossoms, a white arched entry-way awaits as you enter this serene abode. Walking into the double-story residence, a Foyer with polished floorboards welcomes you and leads you to your choice of intimate living areas. 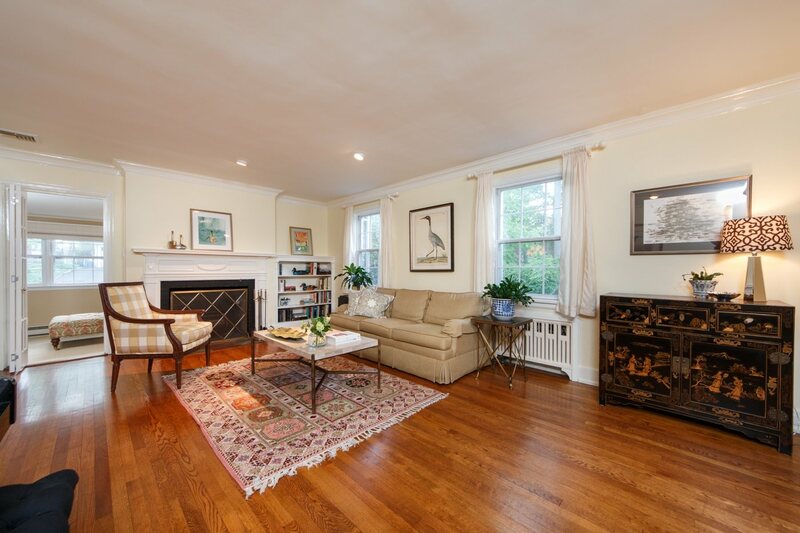 In the Living Room you’ll find an iconic working fireplace with an ornamental white mantel. 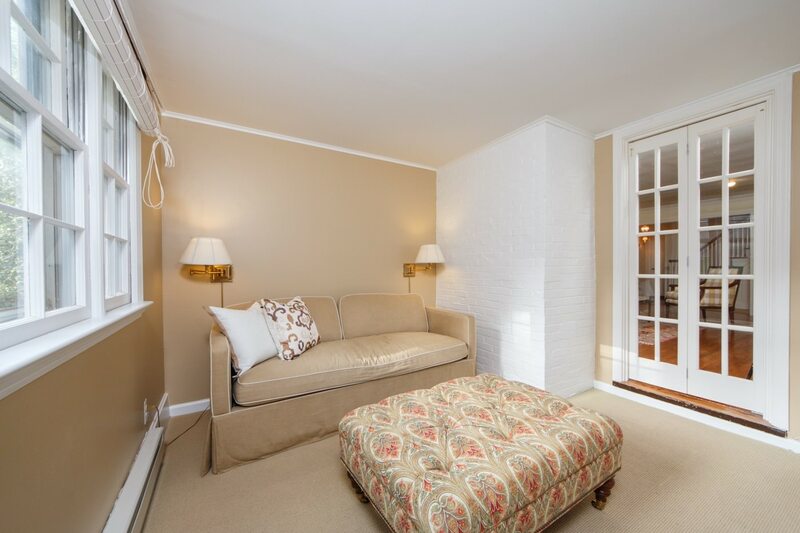 Relax by the fireside as you read with your morning cup of coffee or watch TV with loved ones and pets by your side. Walk through the open-planned space into a light and airy Kitchen with fresh, cool colors, including white cabinetry and warm hard wood floors. 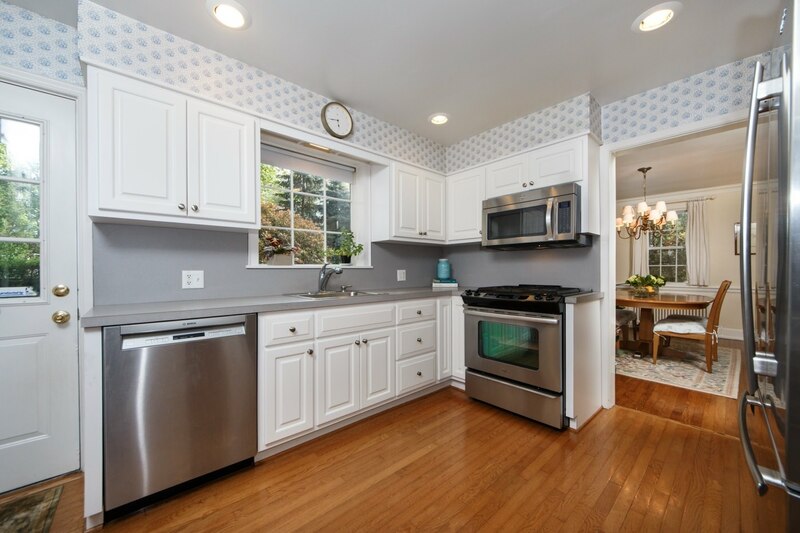 Also featuring stainless steel appliances, matched by a custom nickel-plated fridge, the eat-in Kitchen includes a fixed two seated table to enjoy a quick meal, and a window above the kitchen sink for you to daydream as you overlook the luscious green surroundings. 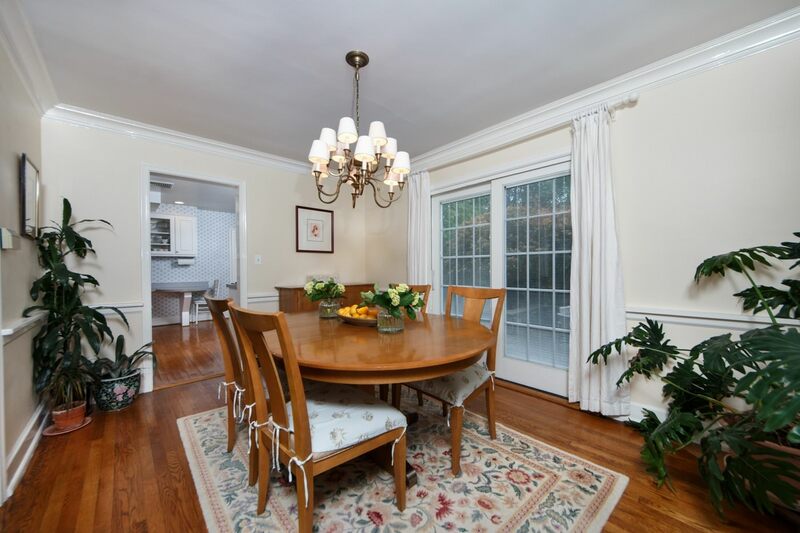 Adjacent to the Kitchen you’ll find a formal Dining Room for entertaining — or for serving meals on nights when all the kids are home for dinner. 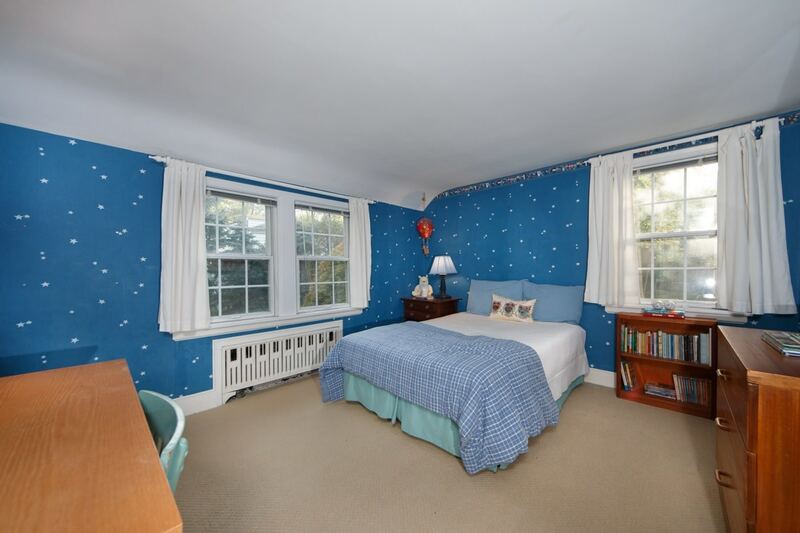 Additionally, there is a carpeted Sunroom to use as a meditation/yoga room or artist’s studio, or to read the paper as you take in the morning sun. 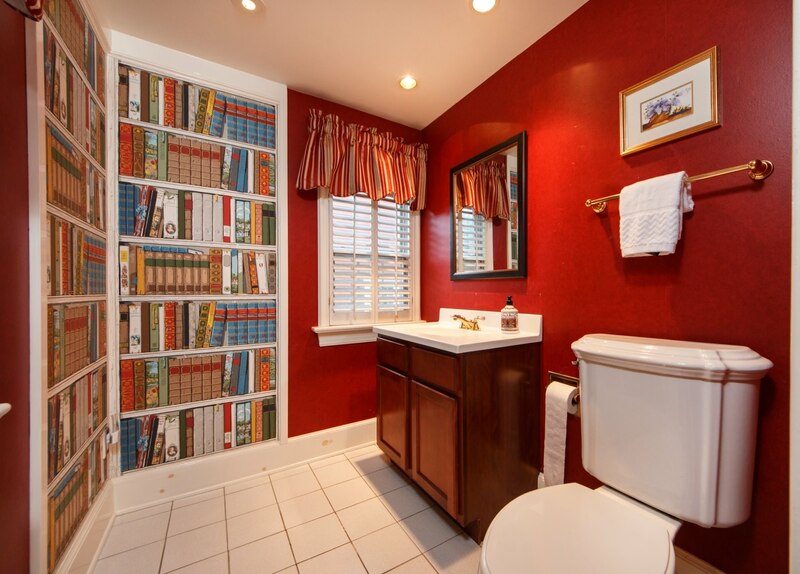 On the first floor, you’ll also find a conveniently positioned Powder Room, strikingly designed with deep-red wallpapered walls, contrasted by the subtler white window shutters, off-white tile floors, and a vanity with storage underneath. It is ideally located for guests who’ve just arrived and need to freshen up, or for you when spending time on the first floor. The functionality continues as you step down the back stairs into a paved al fresco dining area, accented by potted plants and enclosed by a fieldstone wall that provides additional seating. 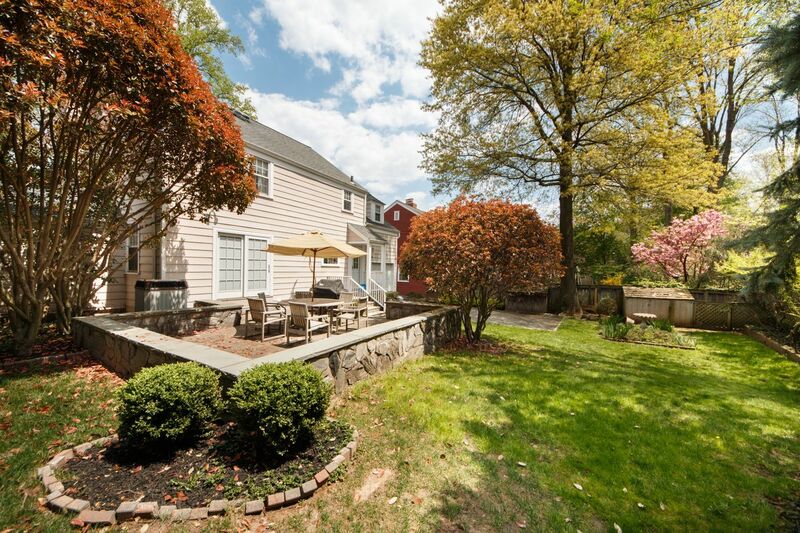 Enveloped by a manicured yard, this tranquil and private set up is perfect for hosting BBQs during the summer or serving a family dinner amongst nature. 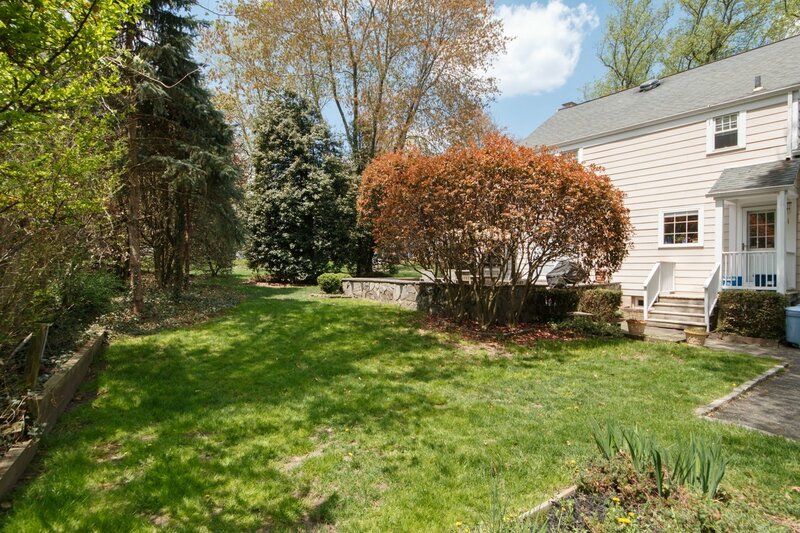 Keep walking into your expansive backyard which is the ultimate outdoor oasis. A large established tree overseeing the property provides shade on a hot summer’s day and beckons to be climbed or used to hang a swing. The yard also comes with an underground sprinkler system, ensuring low maintenance for you, while you bask in the high of tranquility. After dinner, head down to the finished Basement where the spacious layout can accommodate various recreational equipment or a sofa; it’s already wired for cable television. The updated space features modern touches, and the potential for various living and working arrangements. An aptly appointed built-in book case and desk lend themselves to an office space, library, or craft corner. 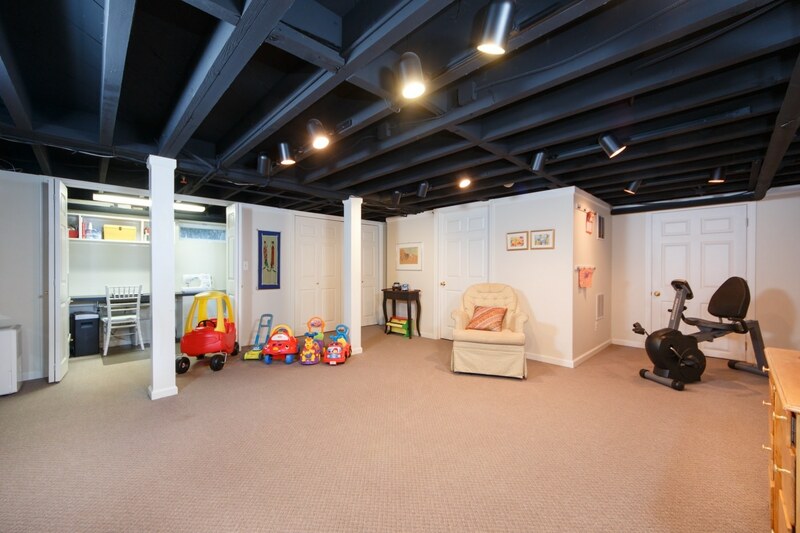 The Basement also includes a “secret” cubby space/kid’s playroom, so the whole family can enjoy their own leisure activities, while being in close proximity. The Basement also has a good-to-go Laundry, set up with a washer and dryer. And with a recently replaced sump-pump (2014), you are completely protected from the elements all year round. 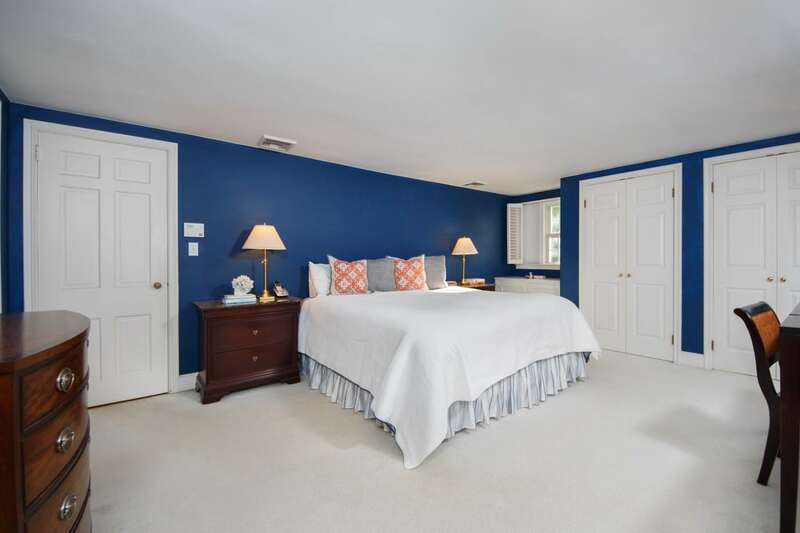 Head up the carpeted, white picket staircase to the second floor and retreat for the night in your pick of two Bedrooms with large closets or the Master Bedroom with an En Suite Bathroom — which includes a stand-up shower with porcelain tile. 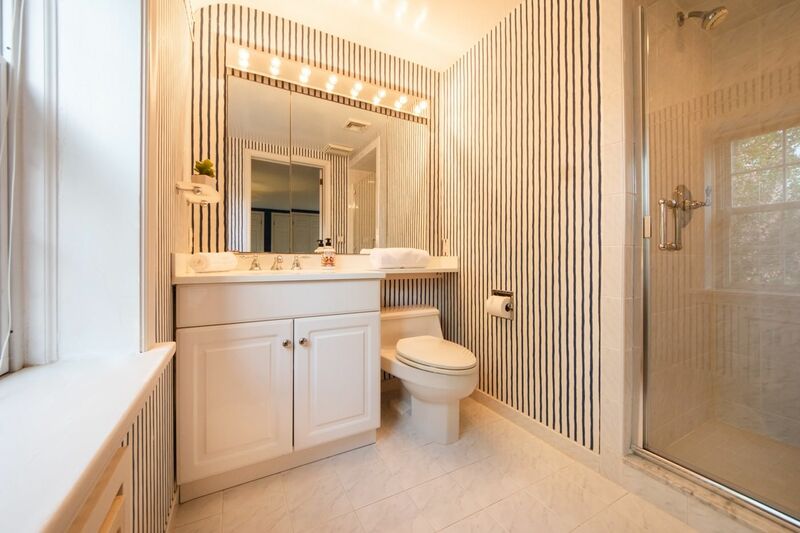 With tile floors, an ample-sized vanity, huge mirror, and charming wallpaper, you’ll have all your needs met. Wanting to soak for a while? In the Hallway you’ll find a second Bathroom with a bathtub. 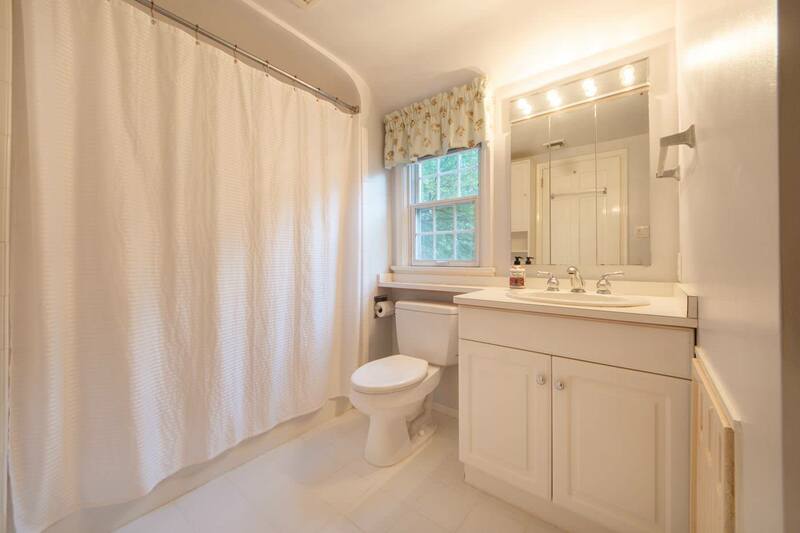 This Bathroom features porcelain tile surrounding the tub and a white-topped vanity that includes storage underneath; convenient built-in shelving and hamper make the bathroom space efficient. 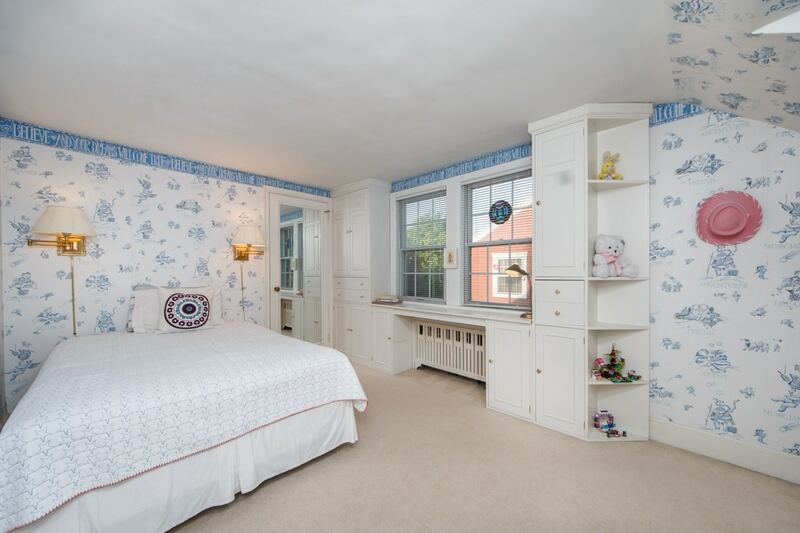 All the bedrooms have walk-in closets and tons of storage with lots of custom built-ins. 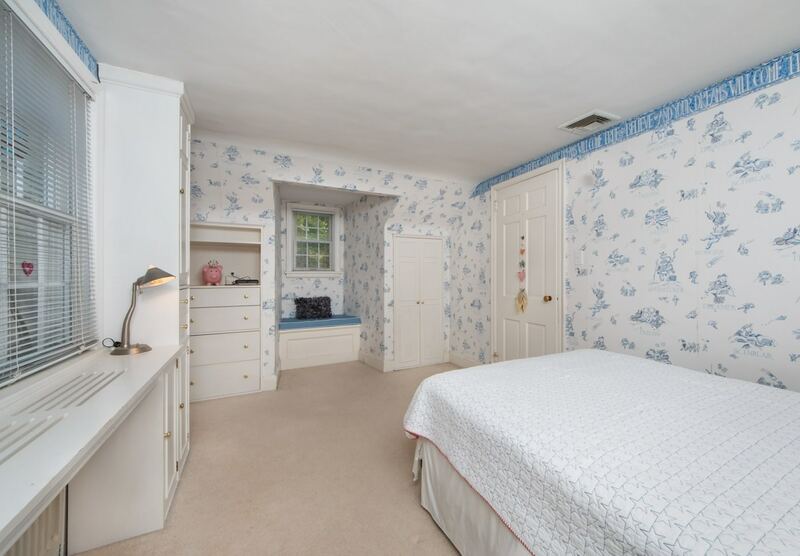 The Hallway space has been optimized and is designed for efficient and practical living, offering a linen closet and access to attic storage — essential for preserving seasonal items and precious mementos! 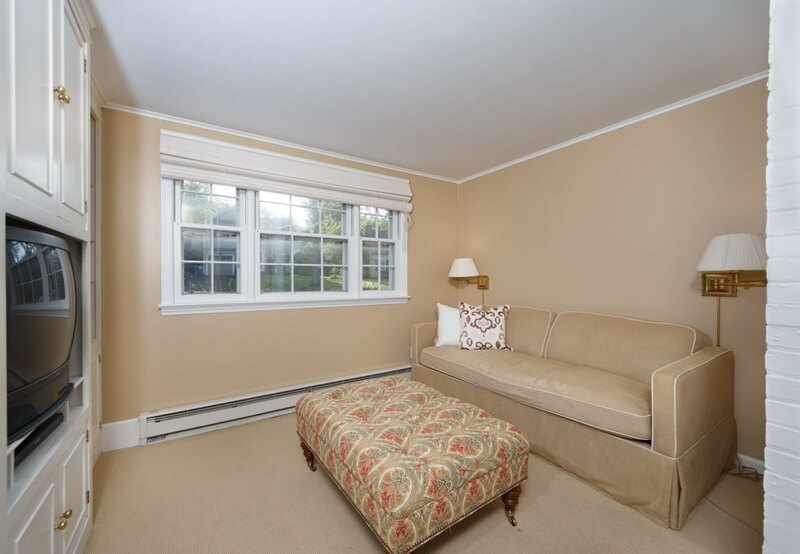 This classic and roomy home is designed with elegance and practicality, ensuring optimum comfort through every season. Drive into your attached Garage and escape the cold by walking straight into the comfort of your new home. And when the family’s indoors, each member can control his or her own temperature using the two-zone heating system – which also ensures keeping energy bills to a minimum by not wasting heat in unused areas. With a new boiler system installed in 2014, central air conditioning throughout and energy efficient Pella windows, you can move straight into this dwelling knowing it has all the necessary environmental controls as well as aesthetic finishes, including window treatments, light fixtures, and other delicate touches throughout. 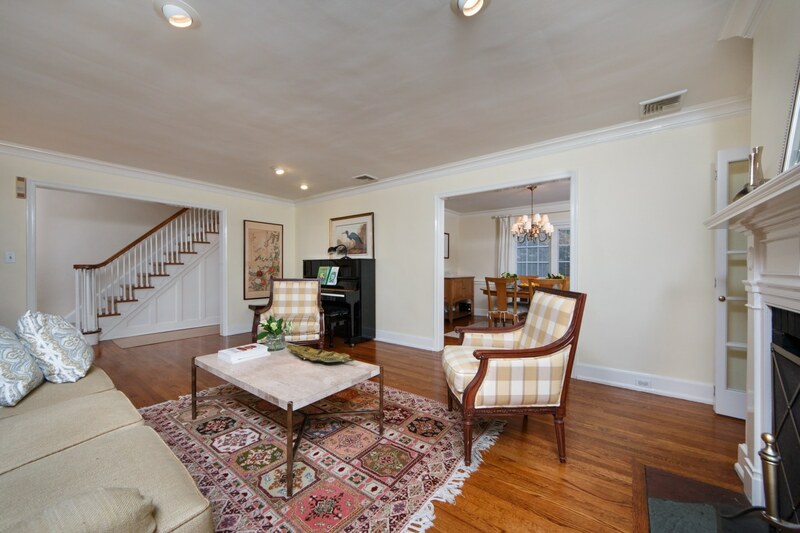 Nestled on a safe and private Short Hills road, with easy access to the I-78 Expressway and Route 24, this well-equipped home with an enviable zip code is primed for creating cherished memories. 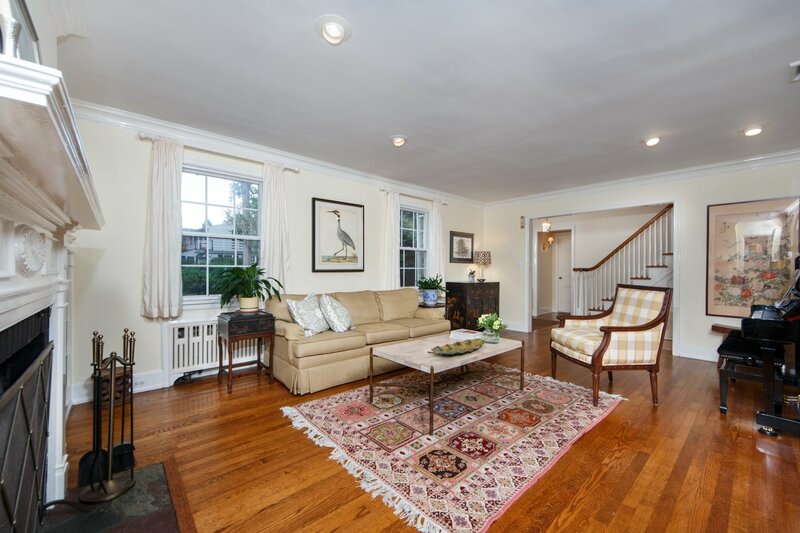 Additionally, its location within a convenient Midtown Direct community means you can have the best of both worlds: enjoy watching your family grow up in idyllic surroundings while still benefiting from a convenient 40-minute train commute to NYC. 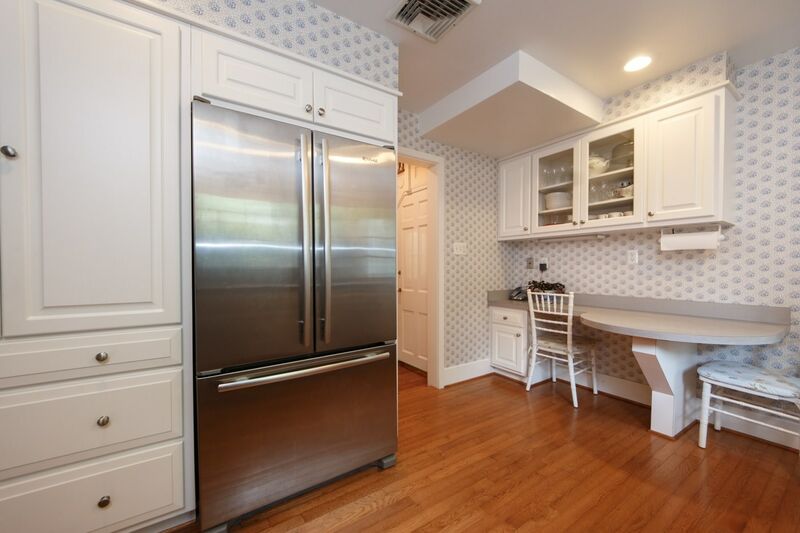 The property is conveniently located to the Short Hills train station, excellent schools and downtown Millburn’s shopping district, which boasts quaint boutiques and an array of restaurants and coffee shops. On the weekend you can go explore South Mountain Reservation, shopping at Short Hills Mall or see a world-class stage production at the renowned Paper Mill Playhouse. This prime real estate zone is also situated within the Milburn High School district — ranked one of the highest in the US — and other Blue Ribbon schools. This home is more than a just a place to rest your head; it offers the ultimate lifestyle in an invigorating location. 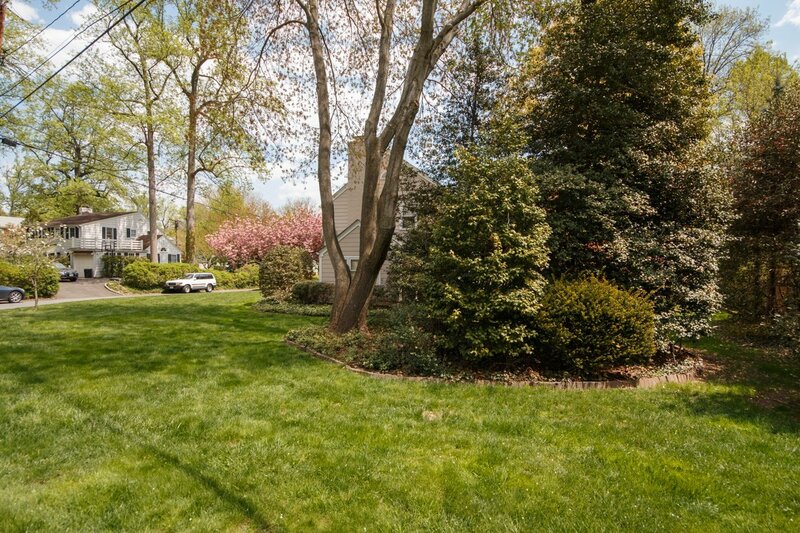 This home offers the cache of Short Hills with a practical touch.